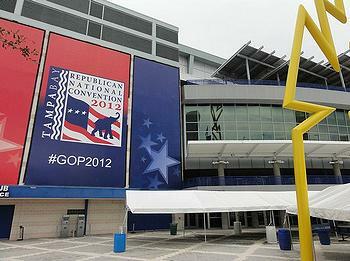 TAMPA, Florida, August 22, 2012 (ENS) – The 2012 Republican National Convention, scheduled to open at the Tampa Bay Times Forum on Monday, could be cancelled if Tropical Storm Isaac strengthens into a hurricane. Republican organizers and Tampa Mayor Bob Buckhorn, a Democrat, are keeping wary eyes on the skies that could blow away their hopes of political and economic success if the convention goes on as scheduled from August 27 through August 20, when presumptive presidential nominee Mitt Romney is scheduled to receive the nomination. As of 5 pm EDT today, Isaac had entered the eastern Caribbean, heading for Florida and is expected to strengthen into a hurricane as early as Thursday. The government of the Dominican Republic issued a Hurricane Warning for the south coast this afternoon and a Hurricane Watch has been issued for all of Haiti. The National Hurricane Center has issued a Hurricane Watch and Tropical Storm Warning for Puerto Rico, and the U.S. Virgin Islands. Mayor Buckhorn said on Tampa television this evening that calling the convention off could be necessary in a worst case scenario. 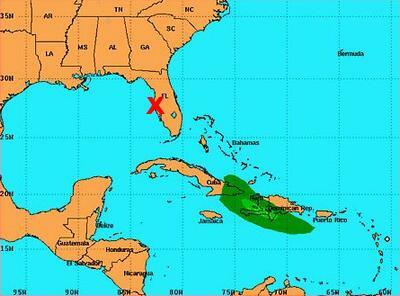 Weather experts say in a worst-case scenario, the storm would enter the Gulf of Mexico, grow stronger over the water, then turn back east toward Tampa. “I don’t think it’s going to be a factor in this particular convention, but we are prepared in the event that it is,” the mayor said. The Tampa Convention Center is in Evacuation Zone A, which would be evacuated for even the weakest Category 1 hurricane. Two hotels where convention goers will be staying, the Tampa Marriott Waterside and the Embassy Suites, are both in Evacuation Zone B, which must be evacuated for Category 2 hurricanes or stronger. The disturbance became Tropical Depression Nine early Tuesday morning and hurricane hunter aircraft found tropical storm force winds in the system Tuesday afternoon. This morning President Barack Obama received an update from the Federal Emergency Management Agency on their efforts to prepare for what is now Tropical Storm Isaac. FEMA has been in close coordination with local officials and emergency managers in Puerto Rico and the U.S. Virgin Islands. The agency has deployed Incident Management Assistance Teams to the U.S. Virgin Islands and to Puerto Rico and has sent liaisons to the U.S. Virgin Islands and Puerto Rico emergency operation centers.